The rental business is starting to roar in fashion. And consumption — the cornerstone of the modern industry — is starting to look just a little outdated as more consumers jump at the chance to borrow for a fee instead of buying, mixing up their wardrobes, trying more daring styles and saving room in their closets. Hard numbers on the budding rental economy are few and far between, but players in the market say their customer bases and businesses are growing — and rapidly. A study last year by Accenture and the World Economic Forum valued the rental and used goods market at $1.8 trillion. Rental isn’t taking over — yet — but it is taking off, as tech-savvy young companies and some retailers follow the lead of most prominently Rent the Runway and seek to help consumers stay on trend. Among the pioneers are Gwynnie Bee, The Black Tux, Mr. & Ms. Collection, Switch, Style Lend and many more. They are the Ubers, Airbnbs and Netflixes of fashion. And the cocktail of psychographic, environmental, economic and social change fueling their rise suggests the sharing economy is just going to keep on growing. Owning just isn’t what it used to be in an Instagram fashion reality. Adriel Darvish, cofounder of two-year-old jewelry rental firm Switch, attributed the rise of rentals to the Millennial mind-set that favors experiences over ownership and also a familiarity with the business model through the success of Uber or Netflix. “Ownership can be burdensome not just on your wallet, but also on your mind and soul — buying is a commitment,” said Darvish, pointing to the fatigue of having to do a cost-benefit analysis for every purchase. “Nobody likes to be wasteful,” he said, adding that renting eliminates buyer’s remorse. And many of the new consumer’s needs for fashion don’t require any more longevity than a click. “Social media is a huge push for this,” said Lona Alia, founder and ceo of Style Lend, a peer-to-peer fashion lending platform that has more than 50,000 users and is starting to market its technology to brands and retailers that want to get into the rental game (a broader trend that others are also chasing). Then there are the dollars and cents and fleeting need of certain looks to consider. Silje Lübbe, cofounder of eveningwear rental newcomer Novo Octo, spent years as a buyer specializing in high-end luxury, working with a less-than-ideal timetable. The self-funded start-up quietly launched its web site in mid-January and has about 160 gowns, many of them one-of-a-kind looks, from brands such as Oscar de la Renta, Gucci, Prada, Dolce & Gabbana and Stella McCartney. Count Novo Octo as the latest entrant in the rush that has built behind Rent the Runway, which launched in 2009 and did the hard work of convincing designers that rentals wouldn’t rob them of business, but would actually serve as a platform to bring in new customers and as an avenue for sales. Rent the Runway has since expanded from apparel to accessories to retail and same-day delivery. Even though that was nine years ago — a lifetime in the online world — Jennifer Hyman, Rent the Runway’s cofounder and ceo, said it is still “the very, very beginning” for the sector. The company offers one-off rentals for special occasions and a $159-a-month unlimited service that offers looks for work, during pregnancy, skiing, working out and more. “Our average subscriber uses Rent the Runway over 150 days a year as a substitution for what’s in her closet or buying something,” Hyman said. For $1,700 a year, she said the company’s average subscriber gets access to $40,000 of designer looks they otherwise wouldn’t generally consider. 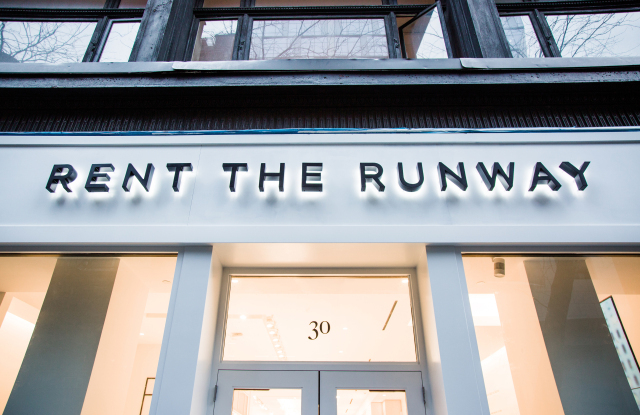 Rent the Runway works with nearly 600 brands and Hyman said it’s never had a brand leave the fold once they’re in. That’s significant, particularly given how skeptically the designer community was at first. But there’s a real learning curve when it comes to the rental economy. Friend said the everyday rentals side of Rent the Runway has become the largest and fastest-growing part of the business. And, yes, rental is a real business, although it takes a lot of investment — for inventory, shipping, technology and cleaning; Rent the Runway has the largest or one of the largest dry-cleaning operations in the country. According to Friend, the economics, in broad terms, break out like this: Rent the Runway buys a dress that would retail for about $1,000 dress for $500 and rents it for $100, along with another $50 rental for accessories. Out of that $150 rental payment from the customer, about $75 of that goes to cover the company’s costs to ship and clean the look and manage the process. The dress can then be rented 30 to 40 times — generating at least $2,250 on the $500 wholesale purchase, setting aside the accessories. “The company’s performing really well,” Friend said. “We have no plans to go public right now. We’re just continuing to build the business and add more inventory. The inventory equation is a little simpler on the men’s side, where The Black Tux has taken on Men’s Wearhouse’s established rental business with about 20 looks and $60 million in funding. The four-year-old company launched with tuxedos, but finds half of its business comes from renting suits to people for dressed-up, but not formal, occasions, like job interviews. The customer’s relationship with the suit is transactional, not long-term. “I see the Millennial customer as not having this sort of pride of ownership that the generations that proceeded us have had,” said cofounder Andrew Blackmon. He said The Black Tux is no longer a start-up, but is scaling its business, recently opening a 100,000-square-foot dry-cleaning facility. The average age is about 38, with working women leading the charge, she said. While there were reservations that customers would worry about how clean the rentals are, Hunsicker said that’s not a problem with 90 percent of people. “The issue is what is the use case that gets me to do this day-in and day-out,” she said. As more companies enter the market and grow into their niches, they each bring their own take on rentals, emphasizing aspects of the experience and helping to normalize the idea that renting looks is something that one does habitually, not simply now and then. And the sheer amount of activity and new entrants in the sector, at a time when retailers and designers are struggling to keep the lights on, underscores the importance of the trend. Trisha Gregory, cofounder and ceo of luxury rental company Armarium, said she is in the process of bringing new global luxury brands on her platform, but isn’t ready for the big reveal yet. Gregory said each rental ends with an e-mail that’s a call to action to buy the look and that Armarium is very aware that it is catering not just to consumers. “I always tell our investors and our advisers that we have two clients: We have our customers and our brands,” she said. Renting particularly resonates when it comes to dresses and bags that can cost as much as cars. Yaraghi, who is also an assistant professor at the University of Connecticut’s School of Business, said handbags and shoes are prime for rentals. There seems to be a company testing nearly every segment of the market. Vladimir Paniouchkine got into the rental game by wanting to be “a better-dressed adult” after graduating from college. He said his girlfriend at the time, who is now his cofounder and wife Victoria, recommended looking at a way to rent clothes instead of spending an arm and a leg to try to acquire a new wardrobe. In 2012, The Mr. Collection was started to rent men’s apparel and 18 months later, the Ms. Collection was added for women’s rentals. With about 5,000 active members — compared to 3,000 last year — the Mr. and Ms. Collection offers three subscription options: The more casual play, the everyday-oriented business and thirdly, a combination. The Mr. & Ms. Collection aims to break even next year, he said. But bypassing ownership isn’t a concept that works only for trendy fashion — it can also apply to more functional apparel. Forrest Shinners founded his ski-oriented business, Kit Lender, four years ago, renting out gear to go skiing, including jacket, gloves, goggles and pants. The business draws on expertise gleamed from his parents’ ski shop in Stowe, Vt., but is not affiliated with it. Kit Lender, which is self-funded, has outgrown its warehouse space and is looking for a 4,000-square-foot facility. Still shipping orders even in late April, Kit Lender expects to end the season with about 7,000 kits. Renting also is a business model that has not only grown in the U.S., but is crossing borders. Le Tote has “hundreds of thousands” of customers in the U.S. and expects to post revenues north of $100 million this year, according to ceo Rakesh Tondon. Users can rent and return their selections or buy the apparel and accessories they try. The firm has been testing the market in China through a private beta program on WeChat. Once it goes full-fledged into China in a month, Le Tote expects to generate more than $50 million this year and more than $200 million within three years, Tondon said. To date, $30 million has been invested in launching the business in China so far. “There are a lot of things under the hood that are hard to quantify,” he said, noting the team built all the front-end software, the inventory management software and other integral tools when developing the U.S. market. While the Chinese customers is slightly younger than the U.S. ones, “she appears to be more open to experimenting with her style than the U.S. customer,” he said. Indeed, taking ownership out of the equation changes consumer behavior and style choices. So rental equals change for fashion, unleashing customers from the burden of buying so they can try more adventurous styles and presenting retailers and brands with ways to connect with consumers.